Central Air Conditioning - Is it Right For Your Home? Providing your home the best air and temperature environment is tantamount to keeping your family healthy. In most homes, conventional air conditioning is the main solution to distribute beneficial air all over the house. On the other hand, there are many factors to consider before you finally decide if this function fits your home and needs. Initially, you have to survey the structure of your home. Take into account its size, square footage and number of rooms. Having this overview can help you determine the size and load calculation of the air conditioning system you will buy, conventional air conditioning, or other. The next thing you have to prepare is your budget as there are two essential costs involved in this home environment improvement project. Equipment and labor are the main factors that comprise your expenditure. What could help you to reduce equipment costs is to buy the air conditioning unit from a licensed retailer. Get quotes from different stores and compare all aspects of what you could gather. Pick the best one that best suits your aeration needs. To make sure the money you devoted for buying the unit is to have an HVAC contractor install it. But scouting once again comes into play here. Seek labor estimates from at least three contractors and select the one who offers comprehensive service, and is backed up by license and impressive work portfolio. As was said, size matters in choosing the central air conditioning system you will have in your home. Too large units may circulate air on and off frequently. Too small units may not be capable enough to neutralize the hottest temperature on certain days. 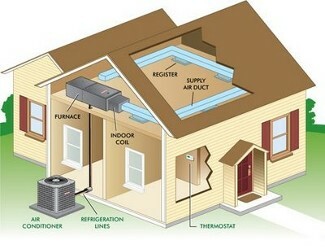 But before you decide on the size, ask your HVAC contractor to perform a load calculation or the Manual J calculation . The result would be based on various factors such as the size of your home, amount of insulation present and square footage of the structure. Another thing you have to consider in getting a conventional air conditioning system is its efficiency. This aspect is typically measured through the Seasonal Energy Efficiency Ratio . Since 2006, air conditioners in the US are required to have SEER from 13 to 22. This rating method includes the start up and shutdown time as well. Once your central air conditioning system has been installed, be mindful of the common reasons that cause its break down. Upon knowing what these problems may be, you could then pursue proper maintenance measures for your unit. This overview can also be your guide as to what to do or how to tell a technician about your problem. You and/or the technician would then be saved a great deal of time once you already know what needs to repaired or replaced. Faulty wiring, low refrigerant or Freon due to leakage, malfunctioning outside fan and unit, and frozen inside coil are the top five reasons that may cause the improper operation of your conventional air conditioning system. Before contacting a technician, diagnose the problem if you can resolve it on your own. For example, if the frozen coil is the cause of your predicament, you can just replace the filters. However, be cautious in doing this. Be sure to strictly follow manufacturer's manual or else you might only end up harming the whole system. And once you feel you are not confident and skilled enough to do the task on your own, hire a professional to address the problem as soon as possible. The Real estate market can be an enjoyable, satisfying and lucrative experience for you. Whether you are a homeowner, a buyer, a landlord or simply a real estate enthusiast, get to know more about the latest in the real estate market now. Read more about it here: Kierland Pool Real Estate and Gated Kierland Real Estate.